You must be seeing a lot of full page advertisements on GST and how it will bring down the cost of the goods and makes taxes and doing business easy. Well.. now a small business has to file GST returns 3 times a month and as for prices going down, I am highly skeptical about it and will have to give it some time. However what baffles me is that fact that the central government is not showing the full picture of the GST, in all their advertisements they have conveniently left or the 28% tax slab from the graphics. 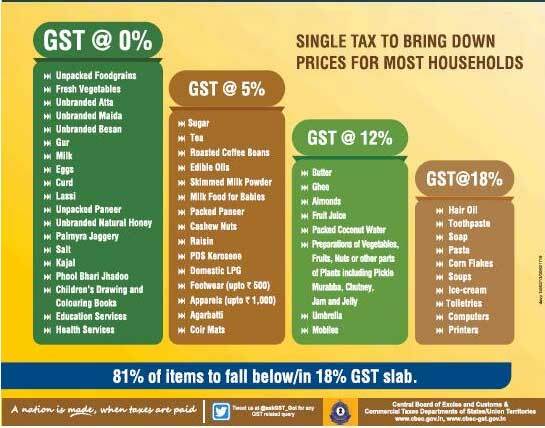 While mentioning that 81% of the items fall below/in 81% GST slab. Which means a chunk of (19%) items are in the highest 28% GST slab. From my perspective, this is a border line misleading advertisement as knowingly facts are being withheld. What are your thoughts on this?